One of the reasons summer weddings are so popular is because they can be comfortably held outside. Surrounded by breathtaking views, or wherever your outdoor wedding takes you, your special event will gain a unique appeal. Procure Amenities: Find out where you’ll get your wedding rentals, such as tables and chairs, bearing in mind that some outdoor wedding venues offer them as part of a package deal. 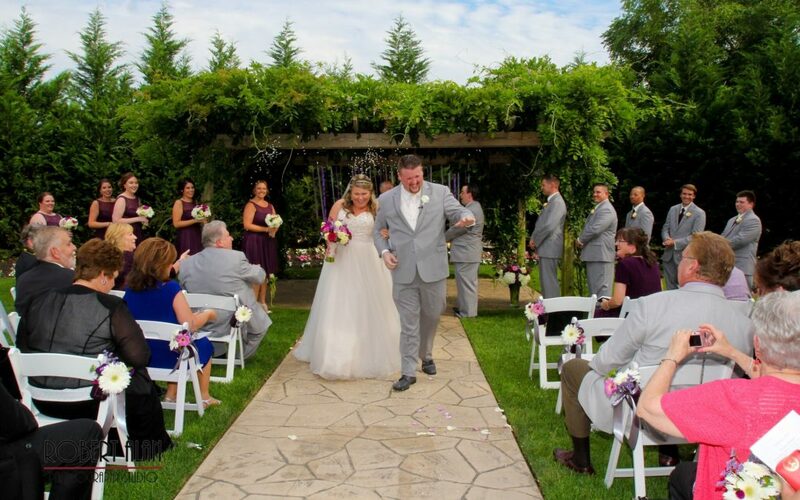 Eastlyn Golf Course & The Greenview Inn, for example, offers the use of our pergola, white padded ceremony chairs, golf cart transportation, and other exclusive services. Inquire about and reserve your wedding day amenities well in advance. Leave “Breadcrumbs”: To make sure everyone knows where to go, create special pathways or arrows directing them to the ceremony site, reception area, bathrooms, and other important places. You may also want to mark these locations with signs. Set Up Outdoor Lighting: If you plan on celebrating until nightfall, outdoor lighting will safely illuminate the area as well as imbue your wedding with a beautiful glow. Candles in jars, tea/fairy lights, or portable lanterns are some examples of what you could use. Your venue may also have outdoor lighting solutions. Plan for Insect Control: Bugs should be a concern for any outdoor event, especially where food will be served. Ask your venue owners how they’ve addressed this concern in the past, and whether there’s a local professional they recommend. If you’re planning an outdoor wedding, consider renting the pergola at Eastlyn Golf Course & The Greenview Inn, which offers a gorgeous view and many amenities. Don’t forget, Eastlyn offers off-site wedding receptions at a location of the bride and groom’s choosing. You pick the place, and Eastlyn will provide all rentals, food, open bar and necessary staff. For questions about our wedding rentals, give us a call at (858) 691-5558.